UltraVan #104 was was specially built for use as a mobile showroom for the Prescolite lighting fixture company. 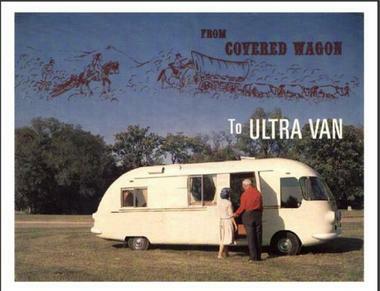 Prescolite took over UltraVan production immediately afterwards, but according to Dave Peterson's notes this coach was built before their management. #104 originally had 13" wheels and a 1962 80 hp Corvair engine, with the lowest gear ratio available (3.89:1?) - which resulted in excellent performance. It was registered as a 1963 model with "4" as the entire serial number. This is the only known coach with riveted aluminum interior wall panels. #104 was extensively modified by owner Murray Fisher, who removed an engine driven split air conditioner, installed large windows in the entry door, the bathroom, and above the trunk, and replaced the large kitchen window with a smaller one. Murray also installed a custom-fitted fiberglass fuel tank (under the driver seat), a (late model) Corvair Corsa dashboard, high-back Mustang bucket seats, spray foam insulation, a flat front floor, and a hollow subfloor with integral wiring and heating ducts. Later, Phil Street replaced the original motor with a new one. Murray & Bettye Fisher, Walla Walla WA 1973-1985. Bought from dentist? The current owners are Tim & Loyce Ericson of Gaston OR. They have plans for a major restoration and modernization of the coach.